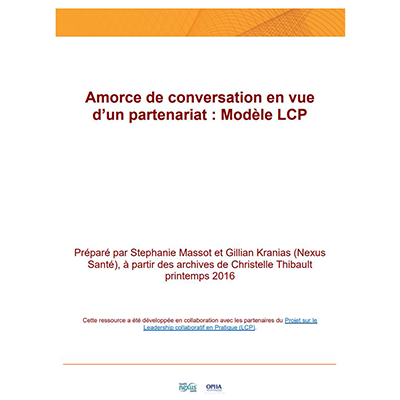 This Partnership Conversation Starter Template was developed by the Collaborative Leadership in Practice (CLiP)* project to strengthen collaborative and equitable leadership in the non-profit sector – specifically in the context of partnerships and networks. For more information and resources about CLiP, visit clip-lcp.org. This template was designed for organizations, networks, and groups/communities that are initiating a partnership or those being approached to engage in a partnership. The Partnership Conversation Starter template can support organizations and individuals to practice anti-oppression in partnerships for research, building capacity, serving communities or other shared goals. It is designed to provide a common reference point for clarifying and negotiating types of involvement and co-leadership; this template can help to ensure that all parties will benefit from the collaborative work. It highlights particular questions for partnership involvement conversations, based on anti-oppression frameworks and Indigenous Knowledge principles (e.g. respecting local context and reciprocity). By encouraging open dialogue on questions of decision-making power and resource allocation, it is designed to favour a shift towards more collaborative and equitable partnerships and networks. Clarifying types of community involvement promotes equity. It can also improve results because when partners are satisfied with the type of involvement they have in activities (e.g. program, policy) their participation is more effective. Also available in Excel format in French and English.